What are The Five Behaviours of a Cohesive Team™? When team members are genuinely transparent and honest with one another, they are able to build vulnerability based trust. The Five Behaviours of a Cohesive Team™ is an assessment-based program that focuses on putting The Five Behaviours model of Trust, Conflict, Commitment, Accountability, and Results into practice. The program is designed to help teams to have deeper conversations about how they work together on a day-to-day basis. It is a program that is rich enough for a team to come back to do again and again. The Five Behaviours of a Cohesive Team grew out of a decade-long relationship with Wiley and Patrick Lencioni and his colleagues at The Table Group. During the development process, they extensively tested and refined the program with more than 300 teams and 3,500 team members. The program helps teams understand how, as a team, they score on the key components of The Five Behaviours model: trust, conflict, commitment, accountability, and results. The program utilises workplace personality assessments to help participants understand the personalities on their team and how they can effectively work together. Additionally the programme is powered by the Everything DiSC personality models that help individuals understand themselves and others better. The Five Behaviors of a Cohesive Team has a simple goal: To facilitate a learning experience that helps professionals and their organisations discover what it takes to build truly cohesive and effective team, by providing individual and team feedback. The program is designed exclusively for intact teams and work groups. Before making your decision on the program, consider the questions: Is the team really a TEAM? A team is a relatively small number of people (we say from three to twelve) who meet on a regular basis and are collectively responsible for results. The team members share common goals as well as the rewards and responsibilities for achieving them. Not every group is a team! It creates a learning experience that helps individuals and organisations reveal what it takes to build a truly cohesive and effective team in the most approachable, competent, and effective way possible. By utilising Everything DiSC, a tool that helps build effective team communication and relationship, this program allows participants to learn about their own DiSC® style, and discover how each style brings value to the team. Can be created for any two participants to illustrate their similarities and differences in a team session or follow up activity to keep the momentum of the program. This report comes with each of the profiles at no extra cost. 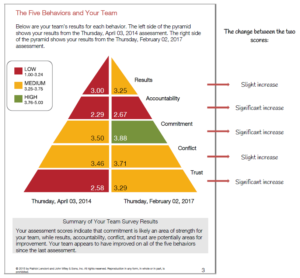 Is for teams who have already taken the original Five Behaviors assessment. The Progress Report measures team progress by graphically comparing how a team’s performance changed over time, ideally over a six month period. This report highlights areas of greatest improvement and decline, offering productive points of discussion, while providing an action plan to help teams prioritise and set specific goals. The Progress Report is no additional cost. Paul, just a quick note to thank you for yesterday’s 5 Behaviours of a Cohesive Team Workshop. I think it was very valuable, I was particularly impressed with the way you handled the balance between independent Coach and actually getting involved and moving the discussions forward. I know the rest of the team felt it went really well too. In terms of Trust building we made a good start and I believe it’s important we continue to work on that and the other four Behaviours as a Board. We are all keen to setup another workshop in around 3 months’ time, so we can do more work with you on further developing the Team ethos.